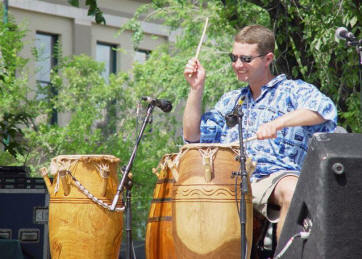 Jay is an African drumming specialist, studying in this field for over 20 years. He holds a B.P.E., B.ED. as well as a Diploma in African Music from the University of Ghana. Living and studying drumming in Ghana for over four years has given him an insightful understanding of African music and culture that he has been sharing this with school students, adults and the corporate world in Manitoba, Saskatchewan and Ontario over the past 19 years. He has performed throughout Canada as well as in Mexico, Israel, the United States and Mozambique. He currently performs with African percussion group "Bafana", Congolese musical group "Trio Afrique", the Ghanaian cultural dancers, and is also the musical director and lead drummer for Nafro Dance. Jay teaches adult group djembe drumming classes throughout the year, operates the Drum Café in Winnipeg, has an African musical instrument importing business and works part time as a travel agent. Since 2011, he has been leading a successful cultural tour every January to his "second home", Ghana.